Zucchini, also called courgette in some parts of the world, is believed to have been first cultivated up to 10,000 years ago! Originally grown in parts of South America, at the time it was primarily grown for its beneficial seeds since the wild variety didn’t have much flesh and tasted very bitter. In fact, the ancient zucchini vegetable didn’t even have much resemblance to the kind that we see available in most supermarkets today. A favorite among low-carb dieters and anyone who wants to lose weight fast, zucchini has a very low score on the glycemic index. Due to its high water percentage, zucchini is low in calories, carbs and sugars, but high in essential nutrients like potassium, manganese, and antioxidants like vitamin C and vitamin A. To add more filling volume to your meals with little extra calories, you can use zucchini in a variety of different cuisines and recipes: a healthy raw snack, dip, side dish or even vegetarian entrée. Even though most people use zucchini like other vegetables — for example, adding it to savory dishes with herbs and protein sources — botanically speaking, it’s actually a fruit. Zucchini belongs to the species Cucurbita pepo and is related to certain other squashes and pumpkins. All summer squashes are members of the Cucurbitaceae plant family, which includes squash relatives like melon, spaghetti squash and cucumbers. These all have similar large seeds and grow above the ground on short plants. Zucchini can come in dark, light green or white spotted varieties and is also closely related to the hybrid vegetable known as yellow squash (or “summer squash”) that has a bright golden or deep-orange color. Indeed, zucchini is a type of squash vegetable, so it has a lot in common with other squashes, including butternut and winter squash. Squashes come in two types: winter and summer. While both types share some similarities and benefits, there are a few major differences. Summer squash, including green zucchini and yellow squash, are lower in calories and much lower in natural sugars and starch, so they have lower scores on the glycemic index. All summer squash are technically picked before they fully ripen and become hardened. Both types of squash groups are a good source of vitamin A and vitamin C, plus potassium and fiber. Seeds from various squash vegetables are known to hold many types of phytonutrients that can help fight inflammation and oxidative stress. Some of these antioxidants include vitamin C, vitamin A, superoxide dismutase (SOD), glutathione peroxidase (GSHpx) and glucose-6-phosphatase (G6Pase). In many nations, summer squash is a primary source of carotenoid antioxidants, including alpha-carotene and beta-carotene. Much of the antioxidant content is held within zucchini’s skin, so it’s a good idea not to peal your squash. One medium zucchini has over 50 percent of your daily vitamin C needs. Vitamin C foods can help maintain the crucial lining of your blood cells, lower blood pressure, and protect against inflammation and clogged arteries. Seeds from squash plants also have a long history of use in traditional and folk medicines when it comes to immune system boosting. Historically, seeds from squash were believed to be antimicrobial and offer antiparasitic properties, so populations believed that zucchini nutrition positively benefited gut, nervous, immune and cardiovascular systems. One 2006 study that investigated the effects of squash seeds (from pumpkin) on immune function found that the raw seeds were effective in alleviating detrimental effects associated with protein malnutrition, free radical damage and oxidation. Pumpkin seed protein isolates hold components that have anti-peroxidative properties that can help improve liver function and detoxification, and researchers believe that, to a somewhat lesser extent, similar benefits exist within seeds of other squash varieties like zucchini. Zucchini and other squashes are largely made of water and carbohydrates, specifically the type called polysaccharides. Summer squash includes a good percentage of the fiber called pectin, which is a type of beneficial polysaccharide that is linked to improved cardiovascular health and the ability to lower cholesterol naturally. Pectin fiber, which is also found in apples and pears, is known to improve arterial health and reduce disease-causing inflammation, so it might also offer protection against diabetes and insulin resistance. And since obesity and heart disease risk factors are often linked, it’s beneficial that zucchini can help support weight loss. Studies show that low-sugar and low-carb diets can be effective in bodyweight management since they positively impact insulin and other hormones. Of course, there are other factors to consider, especially how many healthy sources of fats and fresh whole fruits someone consumes, but zucchini can definitely play a role in a heart-healthy diet that also improves bodyweight. Zucchini is high in the heart-healthy mineral potassium. One cup of cooked zucchini gives you more than 15 percent of your daily value, which is usually more than what’s included in the typical multivitamin supplement! Zucchini and other types of summer squash are often recommended for digestive issues and diverticulitis since they’re hydrating and provide essential electrolytes and nutrients. Research suggests that zucchini also offers anti-inflammatory protection within the GI tract that can reduce IBS, ulcer-related symptoms and leaky gut syndrome. There is now mounting evidence to indicate that a compromised epithelial barrier is associated with low-grade immune activation and intestinal dysfunction that can lead to IBS symptoms in some patients. Eating anti-inflammatory foods, such as plenty of non-starchy fresh vegetables, is the first step to lowering body-wide inflammation and gut-related issues. Zucchini are also very easily digested since they’re largely water, plus they also offer some dietary fiber that can bring natural constipation relief or help treat diarrhea. To obtain the biggest digestive boost, eat the whole vegetable, including the nutrient-rich seeds and skin. You can even add some raw zucchini to your favorite Green Smoothie Recipes. One of the best things about squash is that they are very high in water. While calorie counting is crazy and not the best way to aim for weight loss, including tons of non-starchy veggies in your diet is an effective strategy. Zucchini has a low calorie count and helps to fill you up — since you can eat a whole lot at once for little calories. Zucchini are also one of the lowest carb-containing veggies, second to leafy greens. This is one reason why people like to use them in place of noodles or other carbs. All types of summer squash (and winter squash, too) offer a good dose of phytonutrients like vitamin C, manganese, beta carotene, lutein and zeaxanthin that protect eye health. 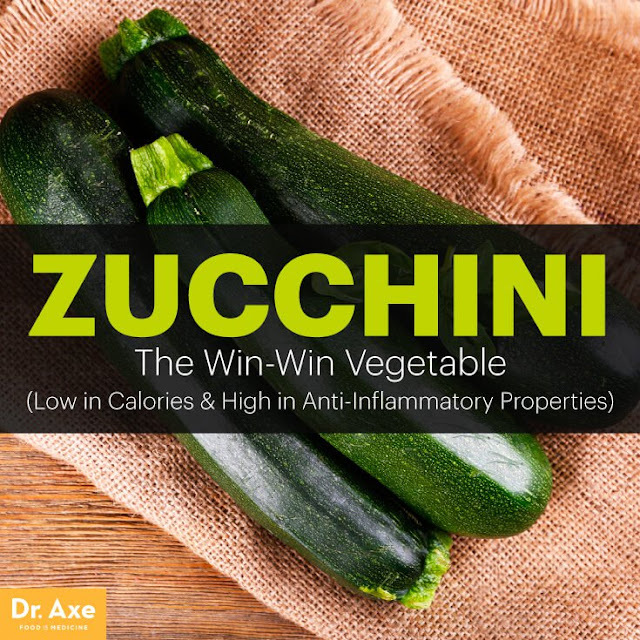 Lutein and zeaxanthin are two types of carotenoid antioxidants found in zucchini that often get attention for defending the eyes from age-related diseases, thus offering natural treatment for macular degeneration, cataracts and glaucoma. They work by protecting the retina, cornea and macula from UV light damage and oxidative stress that can lead to loss of vision and even blindness. In addition to protecting the delicate tissues of eyes, they can keep skin youthful and free from signs of aging, too. Folate specifically is tied to cell growth and aids in tissue development and maintenance. Zucchini nutrition is beneficial for women looking to conceive or who are pregnant because folate allows your body to synthesize new DNA and properly conceive. It’s also crucial for a healthy pregnancy because it helps prevent birth defects and developmental problems. The polysaccharide fibers found in zucchini and other squash, including pectin, have special benefits for blood sugar regulation. For anyone struggling with diabetes, zucchini can help combat problems controlling blood sugar levels since they’re a very low-carb, low-glycemic veggie that helps prevent insulin spikes and dips. The state of prediabetes is characterized by an increase in insulin resistance and a decrease in pancreatic beta cell function. The early stages of type 2 diabetes can be identified by an impaired glucose tolerance or by an impaired fasting blood sugar. Research shows that a diet with high dietary fiber intake of more than 30 grams per daycan be a simple and effective preventive approach. A 2008 study done by the Endocrine Research Unit at Devi University in India found a high presence of polyphenols and ascorbic acid in extracts taken from the peel of zucchini and other squash vegetables. When the researchers tested the effects of using these extracts in rats studies, the group supplementing with squash extract showed beneficial effects in regard to thyroid, adrenal and insulin regulation. They attributed these improvements to the antioxidant effects of squash’s phytonutrient chemicals.